The CO-EVOLVE project’s fourth steering committee was organised on 6-7 March in Bologna by Emilia-Romagna Region, one of its partners. 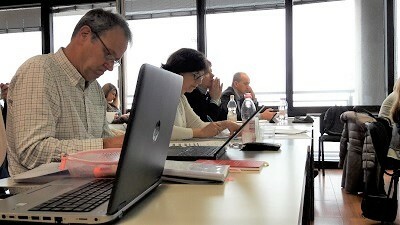 A training course on testing activities in pilot areas was also co-organised by several partners at the meeting. CO-EVOLVE’s partners met in Bologna during a period of transition a for the project which hasjust moved from module 1 (studying phase) to module 2 (testing and transferring phase). After spending over one year – from November 2016 to February 2018 – analysing threats to and enabling factors for sustainable tourism and defining and quantifying tourism sustainability at Mediterranean and pilot area scale, the project is now launching testing activities at pilot area scale. These involve the production and implementation of tourism-driven or tourism-oriented strategic action plans in the project’s pilot areas. During this two-day meeting, internal issues and the overall progress of the project were discussed. Partners responsible for the latest activities of the project’s studying phase – including the analysis of tourism sustainability and tourism-driven strategic planning on Pilot Areas – presented the main results of their work and showed how these will feed the testing activities at pilot area scale. The Emilia-Romagna Region, which coordinates the project’s testing activities, also presented the testing phase’s action plan and expected outputs. This phase involves translating into practice the findings of the studying phase through pilot actions carried out at pilot area scale. The CPMR Intermediterranean Commission (IMC), which coordinates the project’s communication activities, led the discussion on communication and interactions with other relevant projects and initiatives. Partners are now preparing for the Interreg MED Programme’s mid-term event (MADE in Med), to be held on 18-19 April in Rome, and also the ‘sustainable tourism’ community’s mid-term event scheduled for 29-30 May in Rome. They will continue to closely follow euro-Mediterranean initiatives of interest, such as the Bologna Charter; the BLUEMED initiative; the Union for the Mediterranean (UfM) Conference on BE; the EU WestMed initiative; the Interreg MED PANORAMED project and MEDCOAST4BG. On the second day of the meeting a training course was held to help partners be prepared for the implementation of pilot actions, in coherence with Integrated Coastal Zone Management (ICZM) principles and findings from the project’s studying phase. Partners learnt more about a several topics, including ICZM, Maritime Spatial Planning (MSP), land-sea-interaction, sustainability indicators, strategic planning and stakeholders’ involvement/participatory process. A second training course is expected to take place in autumn 2018, back-to-back with the project’s fifth steering committee, due to take place in Barcelona. All speakers’ presentations can be downloaded from this link. For further information, please contact Emmanuel MANISCALCO: emmanuel.maniscalco@crpm.org.